Ricci (pronounced “Ricky”) Rawls — a single mother of five and member of the Philadelphia Tenants Union (PTU) — was evicted from her North Philadelphia home the week of Thanksgiving. Rawls’s requests for assistance were ignored by the Philadelphia Housing Authority, and homeless shelters claimed to not have space for a family their size. Rawls and her five children were forced to sleep on the streets. She feared her children would be taken away and put in foster care. City Council member Curtis Jones connected Rawls with a rental assistance program that enabled her to afford rent for a new home. It appeared that Rawls had secured a happy ending for her story of housing insecurity. But she and her five young children had only progressed to the next chapter of her story. Since Jones secured a rental assistance spot for Rawls in late November, she has been on the search for a landlord that will accept her voucher. Due to her record of eviction, her pool of eligible landlords is extremely limited. Since eviction court records are public, potential landlords can easily see the eviction court history of a potential tenant. In Rawls’s case, her former landlord has admitted that the eviction was not merited and parts of the record are inaccurate. To a prospective landlord, however, the only relevant details of her story are the previous evictions and the damages to the apartment alleged by her previous landlord. Because of her eviction history, the only landlords that are willing to rent to her are slumlords renting uninhabitable apartments. Rawls says that she has gotten her hopes up several times about a new home, only to discover that it is far too small or that it has several outstanding Licenses and Inspections violations. None of the homes she has toured so far would be safe to raise young children in, she says. California seals eviction court records to prevent evicted people from suffering from chronic housing insecurity, and a few other states and cities will seal a record under certain conditions. Donnelly has drafted eviction-record-sealing legislation that he hopes will be introduced in the Pennsylvania state legislature soon. Editor’s note: At press time, Ricci Rawls has at last found a house to rent and has moved in with her children. To help Ricci set up her family’s new home with beds, pillows and blankets, you can donate to her GoFundMe campaign. 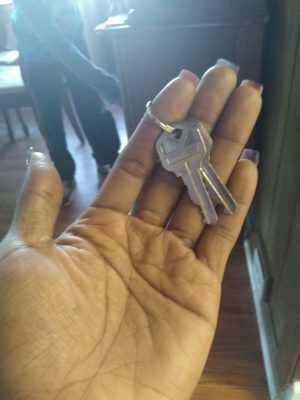 Image caption: Ricci Rawls holding her new house keys in January 2019. Photo courtesy of Ricci Rawls.